Cambridge Park over 55’s leasehold retirement housing scheme in Grimsby has raised £351.86 for charity by taking part in the World’s Biggest Coffee Morning. 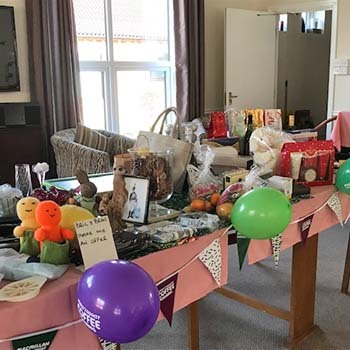 On Thursday 27 September residents and staff at Anchor’s Cambridge Park prepared coffee, cakes and other tasty treats to sell in support of Macmillan Cancer Support. They also organised a Bric & Brac stall, a fun game of put the cherry on top of the cake blindfolded and a raffle from gifts donated by many residents. This is the third time Cambridge Park and almost 100 other hosuing schemes across Anchor have joined forces to organise events and activities on this day. All money raised will be donated to Macmillan Cancer Support, a charity supporting people with the condition and their families. Cambridge Park Manager Robert Chalmers said the coffee morning was a real hit with the local community while raising much needed funds for the charity. He said: “Anchor often works with Macmillan and we know the fantastic work their nurses do. Resident Mr Lamming who has lived at Cambridge Park in Grimsby for nine years, said: “I like living here because there are always lots of interesting things to do. 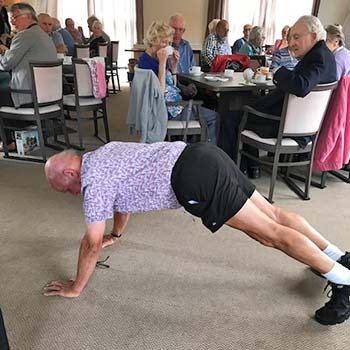 I enjoy organising the Bingo sessions on Saturdays, today I gave a pound to Macmillan for every press up I could do, in front of all the residents in the communal lounge, I managed 30 press ups which was applauded very loudly by the many residents who attended. Friend Joyce Challis added: “It has been really fun doing the coffee morning; I was responsible for baking some cakes and supplying the jar of peas for the Guess the Weight game. For more information on Cambridge Park please call 0800 731 2020.